CamelBak's most technical running pack, the Ultra 10 was designed to endure one of the toughest trail races on earth: the Ultra Trail du Mont Blanc. 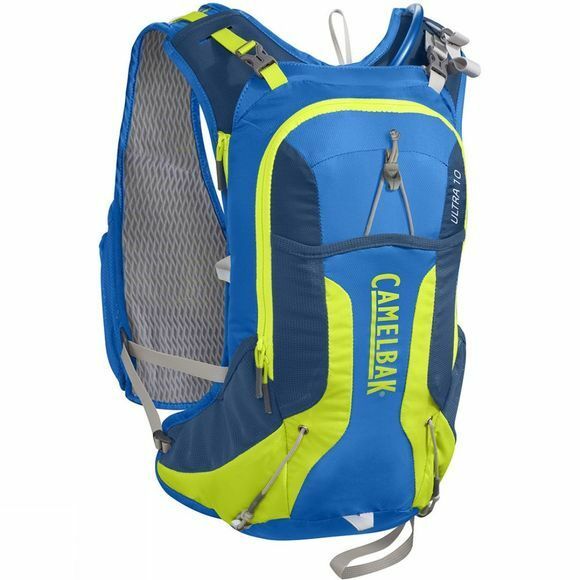 CamelBak engineered this pack to carry every item on the UTMB gear list: a two-litre reservoir, room for food and extra layers, a sweat-proof pocket for your smartphone and two chest pockets for additional water bottles. If it works on Mont Blanc, it can handle just about anything. Refilling on the run? CamelBak have added color-coded straps so you'll instantly know how to access your water supply, and an external-fill design that lets you refill without unpacking the bag. On hot days, fill the reservoir with ice water â€“ the mesh back panel lets it sit against your back to cool your core. CamelBak have also included overflow storage, trekking pole attachments and plenty of lash points, just in case you want to bring something they didn't think of. The custom-fit harness and dual sternum straps adjust for a close, comfortable fit, and the cargo compression lets you cinch everything down to minimize bulk.